Even though we have had good lake storage levels this season, we still endeavour to only release what is required for irrigation and environmental flows. To do this well, we need to have accurate water orders that reflect what is actually happening and going to happen with irrigation demands. Please ensure that you keep your water order information up to date with both orders and cancellations. We have been really pleased with the number of irrigators now using the website for their water orders. This makes it so much easier for us to consolidate the daily orders. Thank you to those 37 new website users! Please avoid relying on phone calls to the operations staff for your water orders. By all means call them if something unforeseen arises with your irrigation needs but please back this up with a revised order or cancellation. Please ensure that your irrigators don’t end up watering the roads! We have had a number of incidents where this has occurred repeatedly this season – it is wasteful, is not a good look for the general public and can be very dangerous to road users (an unexpected windscreen full of water at night can be extremely dangerous). It might also be illegal for this reason. A reminder that we still have significant parcels of both SCFIS and Kakahu shares for sale and for lease. Contact Christine for details. We have also had a request for the purchase of two LPIC shares if any are available please. We are planning to conduct a flushing flow trial on WEDNESDAY 13TH FEBRUARY. The objective of the trials is to test if we can release a flow sufficient to dislodge the algal growth (mainly didymo and some phormidium) that has flourished again this season in the Opuha River. 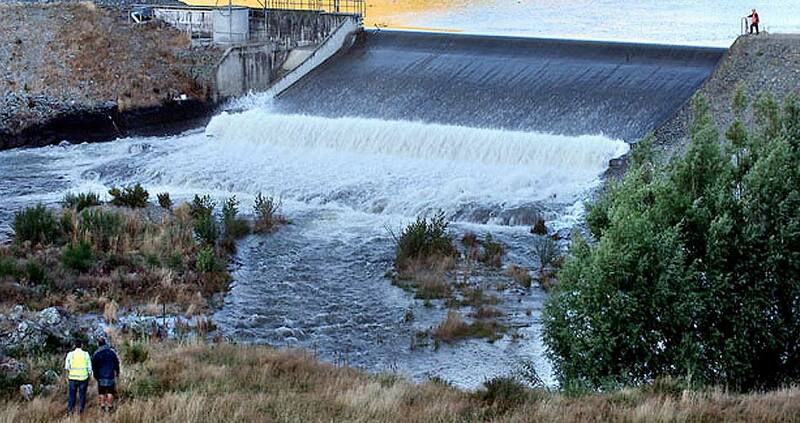 The tests follow on from some river survey and modeling work conducted for us by NIWA last year and will also provide some additional information for the design of the downstream weir modifications. We are planning to release 40 cumecs for a two-hour period beginning at the dam at 8am. This higher flow will result in a bit of a surge in the river flow that will travel downstream and that could catch out unsuspecting river users in the Opuha River. We expect that by the time it gets to the confluence at Raincliff (approx. four hours later) that the level change will be relatively small. We will have warning signs out at Skiptons Bridge and Raincliff to warn of the likely river level changes. It is likely that the higher flow will bring a bit of a flush of algae and weed down the river. The screens on the scheme intakes should handle this extra material but those of you with offtakes directly off the Opuha and Opihi (especially higher up the catchment) are requested to monitor your pump intakes for potential blockages on Wednesday and Thursday. There was a very good turnout for the workshop in October at Pleasant Point on the new Land and Water Regional Plan that was notified by ECan in August. The implications of the Plan are very significant for all rural landowners and the important aspects of these got a good airing at the workshop. Probably the most contentious issue is the potential restrictions on land use change and the requirements for a land use consent if water is applied to new land or the proposed activity increases estimated nitrogen discharge by more than 10%. An important response to this new Plan is a re-focus on the need for an integrated Audited Self Management (ASM) system across our business. The implementation of ASM is a very big undertaking for us and we completed some good planning and preparation work last year, which we now need to finalise and plan for a roll -out at the conclusion of this irrigation season. ASM will require all our irrigators to have Farm Plans that covers the important aspects of the farming operation relating to the use of water and potential risks to the environment. More on this initiative to follow in the next few months. At the end of last year I presented to each of the sub-scheme Boards and to SCFIS Board, an outline of the proposal to restructure Opuha Water Ltd into a much simpler structure that provides for a much more direct relationship between OWL and all the water users. The discussions after the presentation identified a number of common and some unique issues across the various groups. We are now reviewing how those issues can be addressed in a more detailed planning of the restructure process. All shareholders will be required to consider and vote on the restructuring implementation plan once we have a detailed process to present. We have had a good response to our offer to email monthly accounts instead of posting them. This move provides a cost and time saving to us and, we hope, is convenient to those of you who have requested this. To push this along further, this month we will be emailing the monthly accounts to all of those shareholders we have email addresses for. Accounts will still be posted to everyone who hasn’t specifically asked for email only but we are hoping that more of you will advise us of your willingness to change to email copies. We have received a new consignment of the book on the story of the Opuha Dam “A Dream Fulfilled”. This book has proven to be extremely popular – hence the reprint. We would like to make one free copy of the book available to every shareholder. Additional copies are available for purchase at $30 each. Please contact Christine, preferably by email (or call in), to arrange your free copy and additional orders. We held a series of three information sessions in mid-August in an attempt to provide some relevant company information to our irrigators and also to get feedback from you on any relevant issues. We had reasonably small audiences at each of the afternoon and evening sessions but overall we had 36 attend. I accept that our notice of the sessions was quite short and I realise now that including newsletters with the monthly invoices might save on postage but also means most of the envelopes don’t get opened until the 20th of the month at least! The feedback from the sessions was that they were a good idea although better notice and probably a rescheduling to June/July would enable better attendance. There was also support for two sessions with the second one in February.